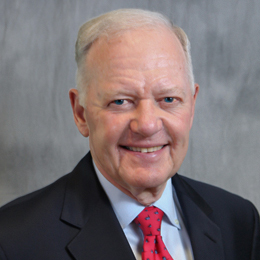 Ray L. Hunt is executive chairman of Hunt Consolidated, Inc. His association with Hunt Oil Company began in 1958 when he joined as a summer employee in the oil fields. Hunt also currently serves on the boards of directors of Bessemer Securities Corporation and King Ranch, Inc. His previous board memberships include the Halliburton Company and PepsiCo, Inc.
From October 2001 to January 2009 Hunt was appointed by President George W. Bush to serve on the President's Intelligence Advisory Board in Washington, D.C. In 1998, Hunt was appointed to the board of directors of the Federal Reserve Bank of Dallas. He served as chairman of the board from 2002 to 2006. Additionally, Hunt is a member of the National Petroleum Council, an advisory organization to the Secretary of Energy in Washington, D.C. Hunt served as its chairman from June 1991 to July 1994. Hunt is also a member of the Texas Business Hall of Fame. Hunt has received many energy industry awards, including the American Petroleum Institute Gold Medal for Distinguished Achievement, the Distinguished Service and Leadership Award of the 25-Year Club of the Petroleum Industry, the Public Service Award of the Society of Petroleum Engineers, and the Distinguished Service Award for the Texas Oil and Gas Association. Hunt has been elected an All-American Wildcatter and the Southwestern Legal Foundation gave him the John Rogers Award "for distinguished service to the petroleum industry and civic institutions." Other awards Hunt has received include the Dallas Regional Chamber of Commerce's J. Erik Jonsson Award, the Woodrow Wilson Center for International Studies Award for Corporate Citizenship, the Dallas Morning News' Linz Award, and the SMU Maguire Center for Ethics & Public Responsibility's J. Erik Jonsson Ethics Award.